Weight: 100 (gr). 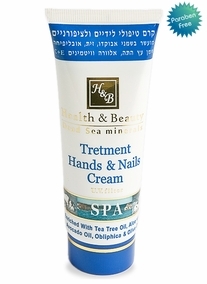 Professional Cream for Hands and Fingernails. Well groomed hands are your business card. One of the best hand creams for men and women alike has been created. It also includes UV filters to protect your hands. The presence of the minerals in the cream combined with the aromatic oils improves the ability of the skin to preserve moisture and serves as a glove to protect the skin against the harmful effects of cleaning materials. It is enriched with Olive Oil, Evening Primrose Oil, Avocado Oil, and Tea Tree extract (which is renowned for its effectiveness against fungus under the fingernails) as well as Aloe Vera and Chamomile. Regular use of the cream softens your hands, strengthens and protects your fingernails and improves the texture of your skin. We recommend keeping a tube of this cream besides your bed, in the office, in your handbag, in the car and in the kitchen. Instructions for use: Use after each time you rinse your hands with soap.